Horrorscreams Videovault - UK based horror site with news, reviews, interviews and more. : 'ASH VS EVIL DEAD' - THE BEST ONE-LINERS! 'ASH VS EVIL DEAD' - THE BEST ONE-LINERS! Ever wondered what happened to Ash Williams after Army of Darkness? Well, all these years later, he’s accidentally unleashed a Deadite plague again! 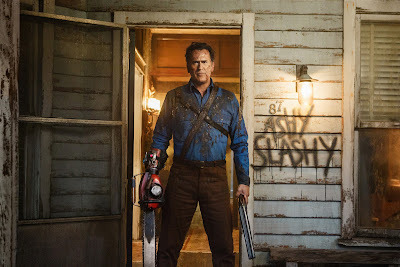 Revving his iconic chainsaw hand one last time, horror legend Bruce Campbell wraps up Sam Raimi’s beloved horror franchise with a blood-splattered bow in Ash vs Evil Dead.